The Swedish Alligator 6×6 & 8×8 Wheeled APC is the Former SEP but lacking the SEP’s hybrid drive and transmission. The SEP modular armoured vehicle (Splitterskyddad enhetsplattform), was a family of vehicles developed by Swedish Firm: Land Systems Hägglunds AB, for the Swedish Army. Development focused on two key area’s, its specialised mission modules which are interchangeable on a basic chassis and a hybrid diesel-electric drive. During 2006 Land Systems Hägglunds AB merged with BAE Systems Bofors and named BAE Systems AB. The new named company is still based in Sweden and is a subsidiary of BAE Systems. 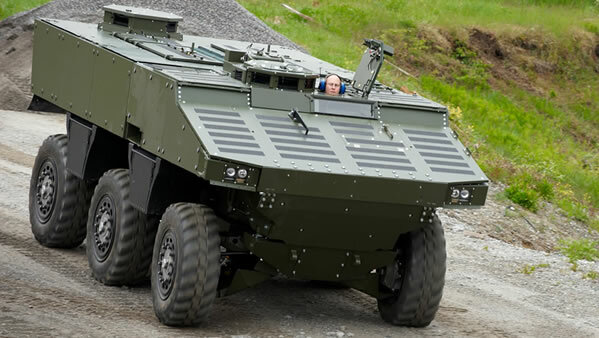 A number of 6×6 and 8×8 prototypes were trialled in Sweden and the UK, but by 2008 no orders were placed for the vehicle, which had reached almost final development. However development of the SEP has ended. Instead BAE launched in 2010 the Alligator. It has retained the specialised mission modules of SEP, but is reported not to be using the SEP’s hybrid drive and transmission. It is most likely been fitted with the transmission from the February 2009 deal with Norway. BAE Systems AB has submitted the Alligator as a candidate for the Canadian Armies Tactical Armoured Patrol Vehicle (TAPV) project. TAPV is a component of the Land Forces Combat Vehicle program which is focused on the renewal of the Army’s core equipment platforms as stated in the Canada First Defence Strategy. Please note: The above image is used on BAE’s Alligator picture gallery, but is also used on their SEP picture gallery too. The TAPV project will deliver a wheeled combat vehicle that will fulfill a wide variety of roles domestically and on the battlefield, including but not limited to reconnaissance and surveillance, security, command and control, cargo, and armoured personnel carrier. Contracts are expected to awarded in 2011/12. Its worth noting that BAE Systems has a number of subsidiaries competing in TAPV.